Business shouldn't stop just so you can make a transaction. These days you can do everything on your phone. 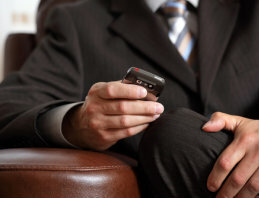 It makes sense that as a business owner, you can also conduct your banking on the go. Log on to complete any number of transactions, from checking your balance in real time, reviewing transaction history, to making bill payments, and more. You can even deposit checks on your own time through your mobile device. You can even deposit checks on your own time through our secure system. Stay connected to your business -- and your banking, 24/7.